MACHU PICCHU, Peru — It's July 1911. This morning in the Peruvian Andes had dawned in a chilly drizzle, but now, hours later, it is hot and sticky, and Hiram Bingham is tired. He had crawled across a primitive log bridge spanning a river foaming with rapids. He had struggled up a densely jungled bank, only to reach the base of a precipitous, slippery and snake-ridden slope. Again, he had climbed, finally reaching a clearing where he, his native guide and an armed guard had met a few Indians, who shared their water-filled gourds and sweet potatoes. The ruins Bingham was seeking were "a little further along," he learned -- but, given the iffy nature of those reports, he had few expectations. Before long, of course, Bingham had rediscovered Machu Picchu. First he came to a flight of beautifully formed stone-faced terraces, then finely made stone houses, then a stone-lined cave that seemed to be a mausoleum, then a temple, keyed to a white granite wall. "Dimly, I began to realize that this wall and its adjoining semicircular temple over the cave were as fine as the finest stonework in the world," Bingham wrote in his 1948 book, "Lost City of the Incas." "It fairly took my breath away." On he went, finding more temples made of huge stone blocks, each weighing 10 to 15 tons. Bingham worried that no one would believe him -- thankfully, he had "a good camera and the sun was shining." Travelers still labor to get to Machu Picchu, which lies about 50 miles northwest of Cuzco. Many trek the Inca trail, arriving sweaty and rumpled; others take a four-hour train ride from Cuzco, followed by a 20-minute bus ride over a winding, unpaved road. Even the luxury train, The Hiram Bingham, takes 3½ hours to get you to the bus. Yet the site, on a ridge at an oxygen-challenged 8,000 feet, must still limit visitors lest it be overrun. What Bingham saw was obscured by vegetation. Today, Machu Picchu sits open, kissed by the clouds and exposed to the sun. 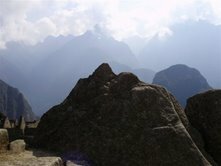 The "old mountain," set against the soaring peak of Wayna Picchu, is an icon, a Unesco World Heritage site since 1983. Yet for all its familiarity, Machu Picchu awes us. Many visitors feel an inexplicable small-s spiritualism about the place. Machu Picchu remains a mystery. Though Peruvian tourist literature usually calls it a citadel, and Unesco terms it a sanctuary, its real purpose is unknown. Machu Picchu clearly had agricultural and urban zones, but was it a working city? A royal retreat? A ceremonial site? An astronomical observatory? A sacred religious center? Some combination of the above? Nor do we know why it was abandoned by the Incas in less than 100 years. The Spanish never set foot here. Did its inhabitants, who numbered perhaps 1,000, leave suddenly, as some scholars have proposed, or is that a myth, too? Even a casual visitor, however, can see one thing: Machu Picchu is an engineering marvel. The weighty stone blocks used to construct its 200-plus buildings were hauled huge distances, probably using ramps. Those terrace walls and houses are mortared, but the special places, like the Temple of the Sun, are not. They are made of precisely cut blocks that fit together perfectly, without mortar, like Lego pieces. More impressive, the pieces also fit snugly against irregular natural rock formations. The Incas shaped the complex to follow the contours of the land. They stabilized flat spaces -- terraces for farming and open areas for plazas -- by building retaining walls. They constructed a narrow, stone-lined aqueduct to carry spring water from the mountains, channeling it through a descending series of 16 "fountains" where the water can be accessed. They knew enough to build underground foundations and provide for drainage. According to "The Machu Picchu Guidebook: A Self-Guided Tour," about 60% of the site's construction lies underground. Ingenious nuts-and-bolts features can't account for Machu Picchu's spellbinding charm, though. Nor can its aesthetics. There's nothing here like the graceful temples that populate the Acropolis or the Roman Forum. There are no sphinx-equivalents, no marble statues. Decoration is nonexistent. In Incan times, Machu Picchu's people and their animals may have worn the colorful weavings available in tourist markets today. They used artifacts made of gold, ceramics and other materials, about 5,000 of which are the subject of a custody dispute between Yale, where Bingham was a professor, and Peru, which wants them for a museum. The two are still negotiating details of a controversial 2007 pact that would, in practice, divvy up the collection. But whatever happens, the ruin has no such embellishments. It is all green and gray. Something else is at work, an elusive pull whose roots lie in Machu Picchu's subtle but widespread connections to nature. Its lofty perch among dramatic peaks was no doubt chosen for its closeness to the sun, the most important god in the Incan religion. At sunrise and sunset, the lighting is ethereal. Though it is just a few miles above the village of Aguas Calientes, the site seems a world apart, unseen until you are inside. Design details reinforce the nature connection. Look through the main gate -- a simple trapezoid, narrow at the top -- and you will see that it perfectly frames Wayna Picchu. A small rock that faintly resembles a condor's head was carved with eyes and a beak to look more so, his broad-spanned wings supplied by the natural rocks behind him. The intiwatana, a huge stone at the highest point in Machu Picchu's urban sector, was sculpted, in situ, from a large white table-like rock and, on first glance, resembles a sundial; it's really an astronomical calendar, tracking the sun through the seasons. On closer examination, you will notice that its vertical column mimics the profile and spine of Wayna Picchu. The view from the intiwatana, which scholars believe somehow figured in religious ceremonies, captures all of the surrounding mountains. And a few steps away is one of the best examples of Machu Picchu's "echo stones" or "image stones," rock monuments carved to resemble the contours of mountains in the distance. Echo stones can be found throughout the complex. It is these and other links to nature that, taken together, make Machu Picchu such a magical place.